Here's a few things FHIA does to make First Hill a great place for everyone. Georgia Gerber, well known for the iconic Rachel the Pig at Pike Place Market, as well as many bronze sculptures located in and around Puget Sound, has been contracted by First Hill Improvement Association to create a sculpture for First Hill Park. Historically, the neighboring Stimson-Green Mansion was home to two orphaned black bear cubs, which is the inspiration for this sculpture. Around 1910, a logger came to the front door of the Stimson-Green Mansion, holding a baby bear in each hand. Raised in the mansion until they were about 10 months old, the bear cubs were considered to be pets of the Bullitt family. First Hill Improvement Association (FHIA) created a national call for artists, received over fifty submissions and selected Georgia Gerber’s concept for her playful interpretation of the bear cubs. A Northwest artist, Georgia has operated her own studio and foundry on Whidbey Island for over 30 years. Primarily working with life size animal and human figures, Georgia often incorporates architectural or abstract elements into her designs. Georgia’s creations emphasize accessible public artwork that encourages viewer interaction. For the past two years, FHIA has engaged the community to reimagine and update First Hill Park, located immediately north of the Stimson-Green Mansion. FHIA secured grant funding from the Department of Neighborhoods and hired landscape architects at SiteWorkshop to guide First Hill through a neighborhood visioning and design process. The design is now complete, and construction is set to begin late Spring of 2019. Funding of the park has been enabled through commitments from Seattle Parks & Recreation and Swedish Medical Center. FHIA has also received generous donations for the sculpture and is actively seeking the balance from local individuals, organizations and foundations. The First Hill Improvement Association received a grant to beautify the 72 columns under Interstate 5 between James Street and Cherry Street. This area is a prominent vehicular and pedestrian gateway to First Hill, but suffered from a drab concrete grayscape. FHIA undertook a public art selection process to hire a designer, and received over 3,000 votes from around the city, ultimately selecting local artist Nathan Watkins and his design, Sunlight Over First Hill. We partnered with local art non-profit Urban Artworks to manage installation, which took over 1,000 hours! We are grateful to the Only In Seattle program from the funding to make this entrance to First Hill as welcoming as the people who live here. First Hill Park is one of the neighborhood's few park spaces. At .25 acres, the park is a contemplative green space frequented by residents and workers, with few activating amenities. The First Hill Improvement Association heard loud and clear that neighbors wished for an update to the park to provide more opportunities to relax and play n this neighborhood jewelbox. FHIA secured grant funding from the Department of Neighborhoods and hired landscape architects at SiteWorkshop to guide First Hill through a neighborhood visioning and design process. You can read the full report from that process. FHIA is now working to secure the funding to complete this provide, and anticipates the completion of this high-quality gathering space in 2019. First Hill remains short of our parks and public open space goals by several acres, making every square foot of the public realm an important part of creating a healthy, green, and lush environment for all. 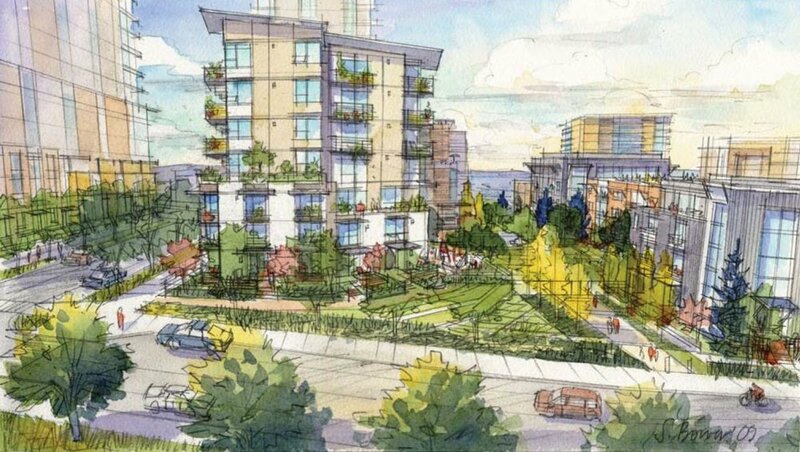 FHIA is proposing a 1.5 mile urban walking path to connect the existing 5.2 acre Freeway Park to the soon to be completed 1.7 acre Yesler Terrace Park. The Park to Park Path connects these important park spaces along our neighborhood greenways of Terry and 8th Avenues, creating a beautiful and safe walking route supported by amenities such as Free Little Libraries, public art installations, and benches. FHIA continues to advocate and plan for capitol improvements along this pathway including pedestrian-priority streets, safe cross-walks and curbs, sidewalk improvements, wayfinding, and lighting. Download the map and take the walk, and then let us know your ideas for improvements along this trail! This film series highlights the people, places, and businesses that make First Hill a rich and vibrant place. The First Hill Improvement Association commissioned these films to help tell the some of the stories of the people who call this community home. First Hill: Second to None debuted at FHIA's annual Valentine's Day Party. The First Hill Improvement Association is dedicated to building community and increasing safety through a robust calendar of community events for all to enjoy. In 2016, our summer event series included a neighborhood dog show, an outdoor reading party, a guided tour of University Street tree canopy, a pop-up petting zoo, an outdoor movie night, and an outdoor bingo night. You can read the full reports from the summr event series below!